Bill Lawrie and Paul Gioia have played for many years as part of country-vaudeville blues band Tin Dog as well as having solo careers. In this new duo, Lawrie and Gioia delve into the rich acoustic piano and guitar blues of pre-war America. Piano blues was popular in the twenties, and piano and guitar duos not uncommon, particularly because of artists like Leroy Carr, Scrapper Blackwell and Big Bill Broonzy. Much less so these days. Lawrie and Gioia are aiming to plug that gap. 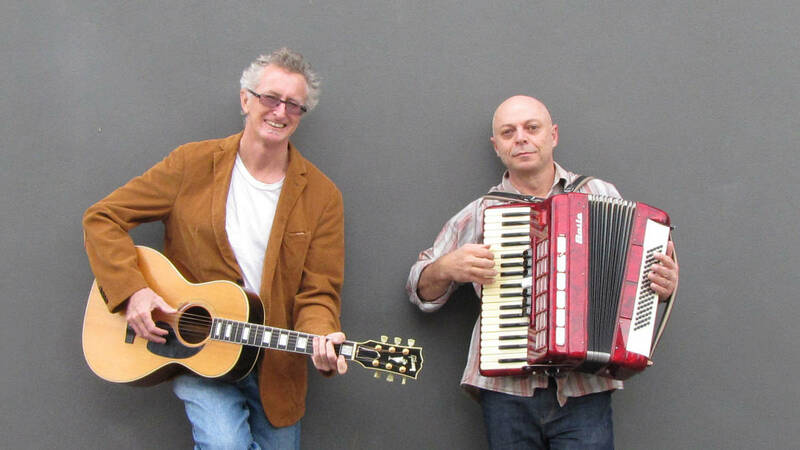 Their new CD, Dead Cat Blues, may be unique for an Australian release, focusing particularly on early piano and guitar blues, and is rising quickly in the Australian blues and roots charts. The CD features some remarkable old tunes, many of which have been reinterpreted by big names like Elmore James, Clapton and Allison. But Lawrie and Gioia have tried to recapture the original acoustic duo sound, with their own particular take, of course. Lawrie and Gioia played recently at Fairbridge Festival and are quickly developing an enthusiastic fan base.